No, I'm not selling them. Beth at Fake Plastic Fish has just connected with me and you really should check out her blog. She has been saving and cataloging all of her plastic (which is really the biggest offender in my book) and blogs about what it is and where it needs to go. Fantastic resource and thanks for connecting Beth. If you haven't seen this it's a great 20 minute little piece on the larger problem of stuff and why it seems so impossible to break out of the buying cycle. I went to get my haircut today and my dad, who is visiting and seems to find this whole thing quite interesting if not a bit odd, looked at me with a little smile and said "What are you going to do with your hair?" which I honestly hadn't thought about. So I explained my "situation" to Billy my coiffure connoisseur (who gives great $10 haircuts by the way) and he was so into it that he actually spent about ten extra minutes making sure none of my hair hit the floor. I brought it home in a bag, and spread it out on the lawn to help with birdies nests or biodegrade, whichever comes first. Over the past two days I have found myself wanting to "cheat" several times, especially when it comes to food...well, junk food really....ok candy bars, just stop brow beating me will ya! Anyhoo, the funny thing is that as I eye something, I weigh the "costs" of eating it (do I really want that in the basement for a year) and then I think "well maybe just one thrown out won't be such a bad thing" and then I realize that I'm the guy watching me and I'd be cheating on myself. So I sulk away and wonder why my wife keeps looking at me that way. I fear it may be a long year. 1 compostable veggie tray - to the worms with it! 1 piece of gum that is drying in the wrapper - sure I could have swallowed it, but Ben Adamson told me in the second grade that it takes 7 years for that to digest, so to the trash pile it goes. So many people have been commenting and emailing me with great ideas and thoughts that I put together a yahoo group for the blog. Basically, you sign up and you can send an email on any pertinent topic to the group. Topics can include plastic, waste, packaging, sustainable living practices, really anything that you think is worthwhile in the fight to minimize waste. The great thing is you "post" simply by sending an email to the site. Then you can choose to receive emails as they come in, a daily digest, a weekly digest, or just check them out on the internet. It's a great way to communicate and while I want everyone to keep on checking in here and commenting with all the great ideas you have to offer, I figured this might be the way to increase the conversation. I realized I should have a link to a rules post so here they are, ready to be added to as I go along. 1. If something is waste that I have generated, I’ve got to deal with it. If I buy something for myself, the packaging is mine to deal with. Hopefully this will entail figuring out what it is made of, what would happen to it if it were “thrown away” and what I will be doing with it. 2. Any waste that I generate that can be recycled, will also be saved. Recycling is better than “throwing away” but it still takes energy and creates waste so I think accounting for recycling will be an important factor. 3. Any waste, which for health reasons (dog poop, medical waste from doctors visits, etc.) cannot be saved, will at least be noted and examined regarding the impact of its creation and disposal. 4. Food preparation has been something that I have been struggling with as I have a wife and two daughters who are not undertaking this experiment. Since food will be prepared for the family at times, I’ll have to figure out how to account for this and will be as honest as I can be in my accounting as I go along. In order to make up for any possible discrepancy in this area, I have decided that when out with my daughters, I will be responsible for any waste they generate as well. 5. I know there will be gray areas that I haven’t thought of, and some of this will have to morph as I go along. That said, I think the golden rule is going to be “when in doubt, it’s my responsibility to deal with”. 6. My wife made some soup from a box (I hate these things) for some friends of ours and since there was extra, I had some. Thought about it afterwards and I don't think this will go to the basement as it wasn't made for me (it would have been used had I not been around) and it wasn't a meal I was eating, just something that was there so I had some. 7. Ok, as I progress, I've been trying to figure out what's "mine" and have been struggling with this, mostly as pertains to food. So I think the good rule of thumb is that if it's something for the family, and I ate part of it for my meal, I've got to own the waste from that food. Having said that, if my daughters eat cereal (ughhhh) and I don't, then the boxes, etc aren't my waste. Seems like that's a reasonable way to go. 8. A few people have mentioned that I'm putting too much paper in the worm bins so i thought I'd address that. When i say its' going into the worm bin, I don't mean immediately, I mean eventually as they need it. I figure if at the end of the year I'm left over with a pile of paper fro the worms, I'll keep feeding it to them and eventually it'll be composted. Same end, just a different time frame. Kevin & Bean will be interviewing me on KROQ tomorrow morning at the painfully early time of 6:20 AM PST. For those of you on the left coast who aren't functioning well that early in the AM, I believe they carry it streaming live, but also replay later in the day so you can hear it after you've had your AM coffee. Listen to it streaming and later in the day here. On January 15th, my friend Anna will begin her trek across the Pacific to study the massive plastic garbage patch that is floating out there. I'll be posting updates as I think this ties directly into what I'm dealing with, packaging. Even if we do the "right thing" and put stuff in the blue bin, it can fall out of the truck, go to the curb, get washed to the sea, and end up floating out there with thousands of it's cousins. I went to Toys R Us last night as my daughters birthday is upon us. If you want to talk about packaging, check this place out. The packaging has packaging and then when you are done, they put it all in a nice HUGE plastic bag. Shocking. I made it out of there fairing better than I thought I would, and will add that stuff to the pile after her b-day. I know some of you will find me doing what I'm doing and heading to Toys R Us to be a bit odd, but I'm trying to live my life as I would have last year this time. Which is to say that I struggle with it, but I'm a normal dad who really loves his kids and while I have a serious problem with buying her stuff from the plastic Xanadu that these stores are, all she wanted was a little stroller that was pink for her doll, and this was the only place I could find one. Having said that I bought the better of the two that I could find so that it will hopefully outlast her and can be given to some other child. Will it end in the landfill? Eventually I will assume, so i think I'll have to eat this one for her sake. Next time you're in a store, Toys R Us, Walmart, or the Supermarket, try and see if you can get out of the store with what you went there for without buying anything that has plastic packaging. And if you can't, which will probably be the case, try to make your purchase choice based on which product has less packaging. My guess is that in many cases there will be slight difference between the products you have to choose from. It's an eye-opener. How psyched am I that so many people checked in yesterday. Thank you so much for all your kind words and support. I truly hope that you check in often and add as we go. I'm going to try to tackle a lot of things in this one post that will touch on some of the comments as I don't have enough time to comment back to each comment (although I'd truly like to). But seriously, thank you. While I am totally thankful to NPR for their coverage (and there will hopefully be more installments throughout the year), for time reasons a lot of things were truncated/cut. To that end, one of the things that I mentioned that got cut was that this is an experiment, not a contest. At the end of the year, I don't win, I'll just be able to look at all the stuff I have accumulated and understand how truly wasteful I've become. This is also about building a community, and hopefully this blog will add to that community. We as a society are faced with HUGE problems and to fix them we in the industrialized world need to create a massive shift in thinking and the way we live our lives. For me, the first step is about reconnecting and figuring out what our part in all of this is. My main goal however is to be able to be an example and for folks to take from it what they will. Great comments from all over the place. 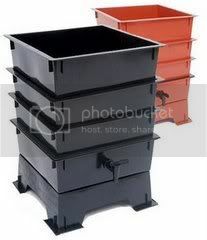 A lot of people seem to be interested in the worm composting system so I will be putting info up on that in the next few days. My friend Augie and I have a sort of East Coast/West Coast worm feud going (I really have no life do I?) and I've asked him to write something up about his composting system that I can include, as he has a very different way of going about it. For the record, the NPR interview cut a bit out about the composting. I am only into a month of the compost system (not an expert yet but learning fats) so it is not up to full speed. That said, when it is a little farther along, it should handle 1-1.5 lbs of food scraps a day. Someone asked why I'm saving my recycling when it is something that is so readily available and a good alternative to chucking it in a landfill. Good question and at first I was not going to save recycling but then I realized if the whole thing is to figure out what my waste impact is, than that must be accounted for. I know this will fill a fair amount of space, so I'll see what happens as I go. Now as for the hunch of two months, I'll bet you I can if you'll put up not using a single plastic bag for the rest of the year (kidding...unless you'd like to in which case I'm game). Seriously though, a big part of all this is I just don't know how much it'll be. We'll see as I go along. Sorry about the laptop lunches link, I'm new to blogging so bear with me. I like the idea of the GE trash compacter. Now if only I could hook that up to my bicycle. Anyone have any ideas on that one. Finally, I urge everyone to check out the comment posted by Smitter which really sums up what I hope comes from all of this. Smitter lives on a farm (I'm jealous) and so is a bit different than most of us, but the point of the comment that I like is that due to packaging and our need for certain necessities, many of us have little choice but to add to"the big pile". Perhaps if en masse, we all stood up and told the companies that make this stuff that we weren't going to buy their plastic enshrined goodies, they'd change. Smitter doesn't save their stuff like I am, but hauls it out so is cognizant of the amount, something which most of us, myself included, aren't. Thanks for the post Smitter and please keep in touch, yours is a great example to follow. Wow, huge response from the NPR interview. I got sidetracked last night so here's my total for Day 2. I'll throw some feedback to comments in my next post. My kids had off yesterday for New Years so today was the first day back to school after taking the pledge. We have been fighting the waste issue on the school lunch thing for a while and anyone with little kids knows what I am talking about. For those of you who don't have kids, companies out there basically market EVERYTHING in small easily packable, easily disposable (har de har har) packages. An average kids lunch will have a juice box, bag of chips, granola type bar, and sandwich in a plastic bag(don't even get me started on Lunchables). Generally speaking all of that ends up in the trash either at the end of the lunch or the end of the day. We re-use all of our plastic sandwich bags by washing and hang drying them so anything like chips (which come from a bulk bag - not so good but better than individual mind you) go into these which come home and get re-used. As for sandwiches, my wife found these Crayola Sandwich containers which really rock. Now I know that they are plastic and note the irony there-in, but these things will get us through many many years of school as they are hefty, and there is a reality to what's going to happen to your kids lunch during the day. The rest goes into re-usable drink containers which come back home, and Tupperware type containers of which we have accumulated many shapes and sizes over the years. Again plastic, but they last a long time as long as you don't get the cheap wimpy ones. My general test is if you can give it a pretty good squeeze and the top won't come off, it's a goody. They also make "disposable" Tupperware believe it or not. Next time you're at the market, check into this. You'll be shocked at what people think is disposable. A cool resource in this arena is Laptop Lunchtimes, a newsletter created by two moms who were appalled to learn that the average school kid generates 67 pounds of waste from school lunches every year (that's over 18,000 for the average size elementary school - yikes). You can sign up for it via email and it has some pretty good tips. I found a pretty cool article online at the Popular Mechanics website of all places that shows the average house and where most of your trash comes from. Interesting that paper is the highest problem they list. I need to read the article more in depth to see where they get their numbers from but I wouldn't be surprised if mail is the biggest problem. I've used Greendimes for a while now and they ahve helped to eliminate our junk mail to next to nothing. Check them out. Madeleine Brand on NPRs Day to Day did a cool little piece on the start of the whole no garbage thingy. It's still weird to hear myself on the radio (I was interviewed back in December for another piece) and it's always interesting to see how they cut things together. I talked to Eve Troeh (who interviewed me here at the house) for about an hour or so and they condensed it down into 2:45. It's a nice little interview and has gotten the word around a bit so that's a good thing. Only down side is that I sound like I've had WAY too much coffee and they cut out my show stopping finale, a little tap song and dance piece that pays homage to all of the Andrew Lloyd Weber shows in under 45 seconds. It's really quite nice. Ok, at this point, I've pretty much gotten through my first day. I started off with something that I knew would be a problem, dog poop. Biscuit, who I happen to think is the greatest dog in the world, starts off every morning by doing her business on a short walk, and I realized way back when I started this that this would be one of my first problems. We have been using BioBags for her for quite some time now and they are compostable and biodegradable. Having said that, I started off day one by depositing the aforementioned bag in the trash bin. Like I said in the rules, certain things for health reasons right? That said, I vaguely recall some sort of dog poop composting system out there so I'll have to look into that. I won't mention this again, but suffice it to say, one of these a day (at least) will be part of my waste footprint. As for the rest of the day, here's what I accumulated. 1 dead 15 watt fridge light bulb - Not much to do with this so in the basement it goes. 1 package from new 15 watt light bulb - Cut up the cardboard for the composter and I'm going to see what can be done with the plastic front and what it's made out of. More to come on this. 7 paper towels- We went to the beach and my three year old and five year old had to use the bathroom several times (amazing how that happens). I instinctively went to throw the paper towels away, realized I couldn't and packed em home. Now before everyone emails me, these were hand towels that simply dried clean hands. Tore them up and put them in the composter. 1 plastic orange juice bottle - my wife bought me this as a New Years breakfast surprise, so down to the recycling pile it goes. 1 paper table covering - we ate out and they had one of those white paper thingies on the table. Too much in the composter today, but I'll add this down the line. 1 plastic produce bag and 1 pound of granola - apparently the best dog in the world found the granola and decided to help herself. The granola will go into the composter over time, and the bag to the recycle bin in the basement as I fear it is not salvageable. Foodwise, my wife made an amazing veggie frittata this AM so we popped about 3/4 lb of food waste (mostly veggie skins etc.) into the composter. MMMMM yummmy. As a side note, my 5 year old asked me why I was taking the table covering and I explained what I was doing. She asked me why I didn't want to throw anything away and I explained to her that when we do that, it gets taken to a large hole in the ground so we can forget about it, but it still causes all sorts of problems. She pointed out that that didn't sound too smart. If only kids rules the world. I should mention that I don't list stuff that is going to the worms here for obvious reasons. It's interesting to me how locked into the waste cycle I am. I started off the day with a runny nose, as I usually do for the first hour of the day, and even though I am intently thinking about what I will need to dispose of, I caught myself right off the bat, grabbing a tissue, blowing my nose, and dropping it in the garbage can. I realized what I was doing just as I was about to let go of the tissue, tore it up, put it in the worm composter, and went back and grabbed a handkerchief. Funny that as with many things, older ideas come back around. The idea for this project came about six months ago as I was throwing something away in the garbage. It occurred to me that I was doing nothing more than that. I was making it go away, not dealing with it, not accounting for it, simply removing it from my sight. When you think of it in simple terms like that, it’s really quite insane. I came to the realization that if we were all accountable for our waste, if we couldn’t simply make it disappear, we’d have to deal with some pretty ugly truths about the way we live. And in so doing, it would cause us to start making better decisions about what we buy, where we buy, and what’s left over when we are done with that purchase. So starting tonight at midnight, I am not going to throw anything away for 365 days in order to see what my impact is. It sounds sort of nuts at first (perhaps for a bit after that as well), and believe me, while I am intrigued by the concept, I’ll admit that there are parts of it that I am dreading. Am I really looking forward to going on vacation and bringing all my trash home in a suitcase? Hardly, but that said, I need to be honest about this or it’s not worth doing in the first place. My hope is that, as the experiment takes shape, I will be able to quickly ascertain what waste I can simply cut out through choices, what waste is necessary but that can be dealt with in a sustainable way, and what waste I just simply can’t do anything about. 5. Finally, I know there will be gray areas that I haven’t thought of, and some of this will have to morph as I go along. That said, I think the golden rule is going to be “when in doubt, it’s my responsibility to deal with”. Where’s It All Going To Go? The bottom line is that I am going into this with an honest attempt and a whole mess of questions. Hopefully I’ll be able to answer all of them, and in 365 days, who knows, maybe I’ll be garbage free? Doubtful, but we’ll see.